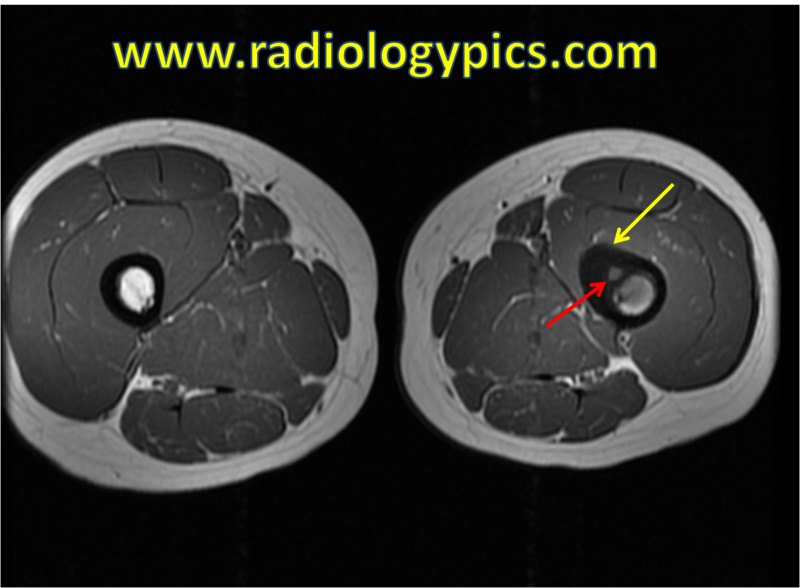 Osteoid Osteoma – Axial T1 weighted MRI of the thighs at the level of the mid femoral diaphysis shows a focal isointense nidus (red arrow) with surrounding cortical thickening (yellow arrow) in the left femoral diaphysis, compatible with an osteoid osteoma. Osteoid osteoma – Axial T2 weighted MRI with fat saturation at the same level reveals the hyperintense nidus (red arrow) with surrounding hyperintense signal (yellow arrow) representing reactive edema in the bone marrow and soft tissues. This is classic for osteoid osteoma. This is a classic case of an osteoid osteoma. An osteoid osteoma is a benign osteoid producing bone tumor. They are radiolucent on radiographs and classically have tumor nidus surrounded by reactive sclerosis on radiographs and edema on MRI. Osteoid osteomas represent approximately 10-15% of benign bone tumors and classically present with pain at night relieved by NSAIDs (non-steroidal anti-inflammatory drugs). 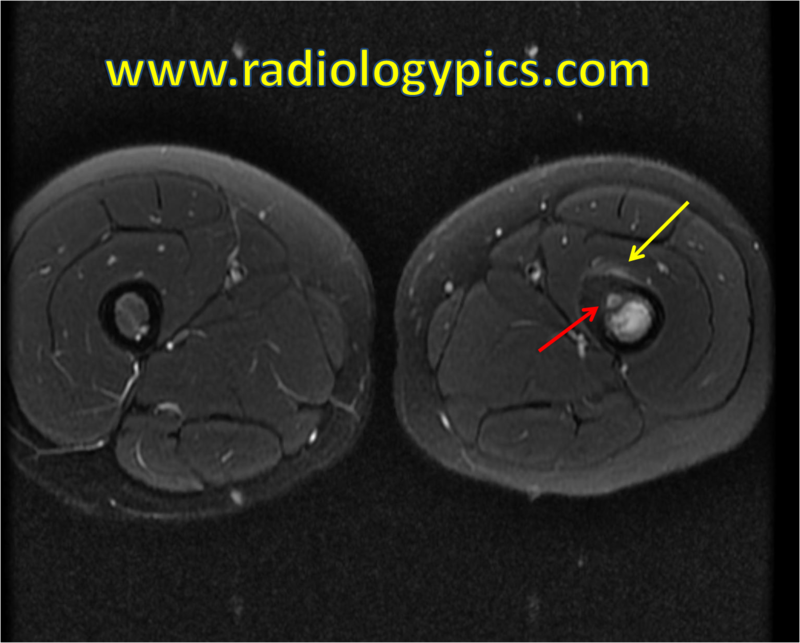 The above MRI images beautifully represent the classic findings of an osteoid osteoma. On T1 weighted MRI the nidus is typically hypo to isointense with surrounding cortical thickening (first image above), and on T2 weighted MRI the osteoid osteoma is typically surrounded by reactive bone marrow edema (high medullary signal in the second image above) and edema/high signal in the adjacent soft tissues.